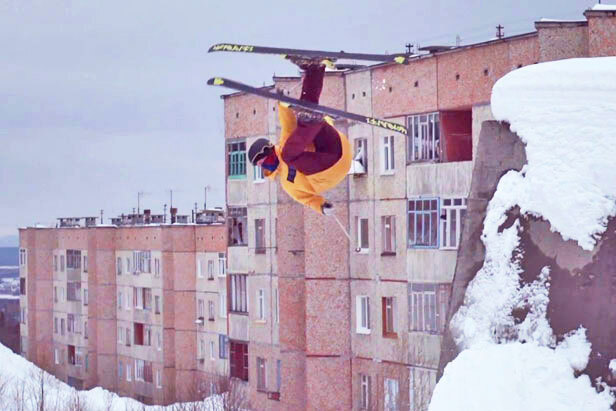 Finnish film collective Nipwitz took a trip into Russia’s Murmansk Oblast (the towns of Kandalaksha, Monchegorsk and Kirovsk) to film a little bit of urban skiing. Here, the crumbling Soviet structures act like a giant adult playground, allowing skiers countless obstacles and trick variations. The neighborhood kids come out to watch and eventually join in the fun. However, as director Aarni Toiviainen mentions in the beginning of the film, Russian hospitality can sometimes be a little hit or miss. In the far northern hinterlands of Russia, dilapidated relics of the old Soviet Union dot the arctic tundra. For the few people still living in these remote regions life can seem rather bleak, which has led the local youth to develop their own unique style of adrenaline-vodka fueled stimulation.